Since the founding of the Big 12 the sport of football has not been kind to the Iowa State Cyclone team. But I remember a time, when the Cyclones became a force in the old Big 8. And as a 12 year old I got to witness it. Growing up in the New York Metropolitan area, it was pretty easy to fall in love with football. I had the privilege of being able to watch two hometown professional teams every weekend on television. I know that is pretty common anymore, but I'm talking back in the 60’s. Besides watching the Giants and Jets, every Saturday I'd sit in the stands with my parents and watch my three brothers play high school football. With Mike graduating in '64, Ray in '67, and Rich in '69 we were able to watch one of my brother’s play for the whole decade. They were all good football players in high school, but my brother Ray was the one that would bring fame to our hometown. By the end of his junior year he began receiving offers from different University's around the country. Dom Sgro, his high school coach would play a big part in helping Ray decide where his college football career would take shape. Coach Sgro graduated from the University of Iowa and suggested that Ray might look into the schools in the Midwest. Not wanting to wait for Ray to make these calls, Coach Sgro began the process for him. At the time, I was 12 years old and really had no idea as to what exactly was going on. But that one night when a recruiter from Iowa State University entered our home, that memory will stay with me for a lifetime. He shook Ray's hand, my mom's, my dad's, and even mine! He began talking about the college experience and a football program on the rise. He then opened his luggage and pulled out a 16mm projector. Ray pulled down a painting and we began watching Iowa State football on our living room wall. Iowa State offered Ray a full scholarship and his collegiate career began when he signed a letter of intent early in '67. For the first time in my life I began to look at college football in a different light. I began to watch college football on Saturday's instead of pro football on Sunday's. I had this fantasy of someday watching my brother play on national TV. But it disappeared for awhile. First, he was red-shirted, so year one, for me was down the drain. By the second year, as a red-shirt freshman, Ray still didn't play and didn't make the travel squad. I never really knew how Ray felt about all this. I'm sure it had to be discouraging. It was also a time of fear and anxiety for him. The coaching staff that recruited my brother was no longer there. Iowa State hired a new head coach, a coach with a proud family, yet he was coach who was never a head coach before. His name was Johnny Majors. Things began to change in Cyclone Country! By the time Ray's sophomore season started he had gained a lot of weight and was moved from his tight end position to offensive guard. And by the time the 1969 season began Ray had made the travel squad. My folks began to pay more attention to Iowa State's football schedule and began making plans to maybe see at least one game a year. Early that year, the Cyclones had to travel to Syracuse. It was still quite a distance from our home in Closter, New Jersey, but it would be our only chance to watch a game in person that year. In 1969, Syracuse had a very good program while Iowa State was still struggling just to win some games. It was a great game which surprised a lot of people. Iowa State lost by one point, but the seed of gaining respect was planted. Record wise, 1969 wasn't a great year for the Cyclones, yet as fans, we knew good times were coming. The 70's would start with Iowa State playing in one of the strongest conferences in the nation. The Big 8 had Nebraska, Oklahoma, and Colorado. It would be hard for any of the other five schools to crack into the upper tier. Johnny Majors had other ideas. The homecoming game in 1970 was against Oklahoma. We went to that game and for the first time since his high school days, I got to see my brother play in a game. Now as a junior he was starting on the O-Line. No one, including myself, gave Iowa State much of a chance against the Top 10 powerhouse Oklahoma Sooners. The Sooners scored first and I began praying for it to at least be a respectable game. Then the Cyclones scored, then they scored again and again. By the start of the fourth quarter a major upset was in the making. Iowa State was winning by two touchdowns. At that time, being up on Oklahoma that late in the game was almost a certain victory. Though Chuck Fairbanks was the head coach for Oklahoma, it was Barry Switzer's wishbone offense that was well known around the nation. The one bad thing about the wishbone was that it was a run oriented offense. If you fell behind it was difficult to catch up because this offense rarely, if ever, threw the ball. While everything was in place for a miracle there was still 15 minutes of football to be played. The Sooners started the quarter with a quick score and still with a lot of time on the clock, the Cyclones led 21-14. With the ball back in their hands, the Cyclones began moving, slowly but surely, down the field and the clock began to dwindle down. With a little under eight minutes remaining Iowa State scored again and had re-opened their two touchdown lead to 28-14. Clyde Williams Stadium began to roar with excitement. Everyone knew that Oklahoma couldn't throw the ball we began smelling the sweet smell of victory against one of the premier schools in the Big 8. Yes, a miracle was going to take place. The thought of this dream coming true for Cyclone fans would turn into a nightmare. The one thing Oklahoma could not do, they started doing with total precision. 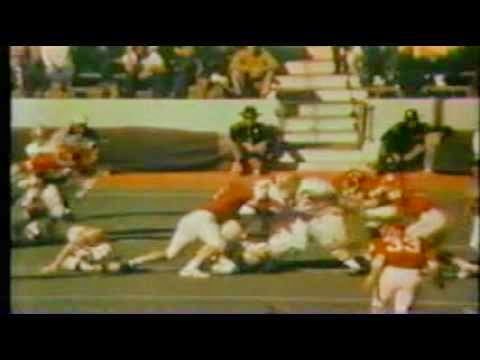 OU's quarterback, Jack Mildren threw the ball with such accuracy, it was like he did it all the time. It was the eighth game of the year and Mildren had thrown about 15 passes all season. Against Iowa State, in that fourth quarter he would eclipse that total. With about five minutes left, OU had cut the score to 28-21. They surprised everyone in the stadium by not trying an on-side kick. Five minutes were all that separated Iowa State from having probably its biggest victory in school history. Now it was OU's defense that stepped up and stopped the Cyclones on three plays. The ensuing punt was a thing of beauty. The Sooners had the ball with three minutes to play and roughly 70 yards to go for a touchdown. Mildren continued his mastery of throwing the ball and OU moved the length of the field in a little over a minute. With one minute and 57 seconds left in the game, the Sooners scored on a 15 yard pass play. The stadium that for most of the day was loud, all of a sudden became quiet. Fairbanks would go for 2 points and the Sooners got it. The final score - Oklahoma 29 Iowa State 28. Even though Iowa State lost the game, a football program was changed. What started at the Carrier Dome in Syracuse, NY, was completed in Ames, Iowa. Iowa State under the direction of Johnny Majors was ready to play with the "big boys." The Cyclones finished the season at 5-6. It wasn't a winning season but the foundation was in place for the years to come. 1971, my brother, now a senior, was one of the captains, on a Cyclone team that would make history. Iowa State would end the year at 8-4. Their four losses were to No. 1, Nebraska; No. 2, Oklahoma; No. 3, Colorado; and their fourth loss came in the Sun Bowl (the schools first bowl appearance) to LSU. In the end, Iowa State would make history one more time, by ending the season being ranked at No.17 in the Coaches Poll. Ray's career would end a month later playing in the North-South All-Star game. A fantasy that was born five years earlier became a reality in 1971. I got to watch Ray appear twice on our TV set. The first time, even before the kick-off of the Sun Bowl, standing at mid-field for the coin toss. And then at the North-South game. Six players from that '71 team would go on to play in the pros. Coach Majors would lead Iowa State back to a bowl game in '72, then resign to become head coach at the University of Pittsburgh, where he would win a national championship. For a school that had no real football tradition, the 70's put Iowa State on the map. They would have four eight win seasons and be invited to four different bowl games. And I can say that I was there when they turned the corner. It was a loss, but in the minds of players and fans, that one point loss to Oklahoma proved to everyone that there was a new power in the Big 8. Dave, I hope that you are still following the Cyclones! It's been a long time coming but we are arriving. We Cyclones never give up. I was at that Sun Bowl game in 1971 as well as at every Iowa State Cyclones home game from 1966 through at least 1986 (and some away games and other bowl games). So I got to see your brother, Ray, play a lot of times. I hope that you are able to make it to some of the games as the atmosphere at our home games is truly amazing and uplifting. Dave- After a bit of checking around the internet I see that you are a member of "CycloneFanatic.com" and were on there a couple of weeks ago. I'm happy that you are actively following the Cyclones and are aware of our successes. Onward and upward and Go Cyclones!